A great many things flow through my mind when I’m being ignored at a restaurant, once I become bored with my phone. Will I starve to death in this place, with lunching desk jockeys and freelance debutantes stepping over my desiccated remains? Are these walls supposed to be yellow? Did I remember to pick up my dry cleaning? Will I be able to restrain myself, once again, from committing parricide this Christmas? What do cats really think of us? All these thoughts, but not necessarily in that order, flashed through my mind as I waited 45 minutes for my food to arrive at the latest branch of Breddos Tacos in Soho. To be fair, this patience-sapping lapse in customer service only happened once across my four meals at this second permanent location of the famed former street food stall. And most normal people, who aren’t restaurant reviewers keen to see how the waiters deal with their own mistakes, would’ve complained a lot sooner. The basement area was curiously unused across all of my visits. But it still takes a special confluence of lackadaisical logistics, rushed-off-your-feet brain farts and a crippling inattention to detail for staff to fail to notice that a customer has been sitting without food for 45 minutes. And then to not only sheepishly admit that the order has been lost only after being pestered, but to make that customer repeat their order on three separate occasions before it finally sticks. An hour and a half – in total – is a long time to wait for a taco lunch. 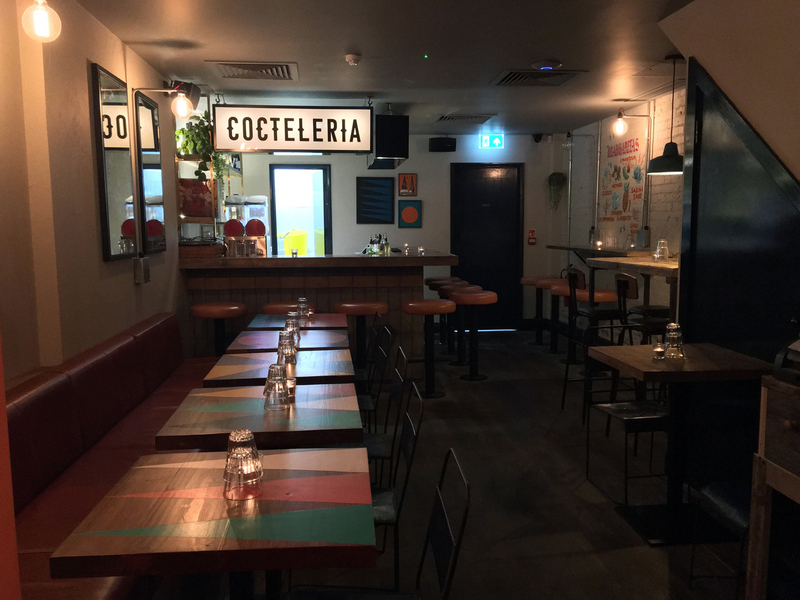 Here’s a free tip for the front of house at Breddos’ Soho restaurant – an apology is far more convincing when given with eye contact and clear enunciation that avoids mumbling. Given the length of time that it took for my food to arrive, perhaps Breddos grew the apples and jicama, a Mexican tuber, in Mexico itself before shipping ’em over and chucking it all together as a salad. 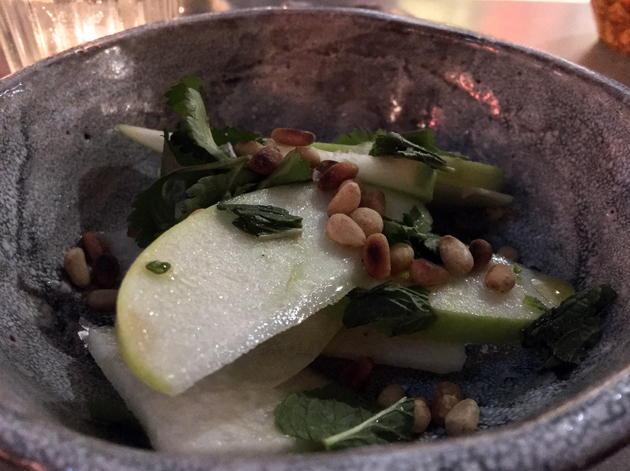 It was a very satisfying salad though – sharp and sweet apple meshed well with the melon-like jicama. This refreshing pairing was made even better by the powerful nuttiness of what appeared to be pine nuts. Lamb tacos were effectively miniature shawarma. This isn’t as incongruous as it initially sounds given that tacos al pastor, now regarded as a Mexican classic, are descended from that delicious Levantine meat tornado. Breddos’ effort was a sumptuous affair and arguably better than a lot of the more straight-up, half-hearted shawarma in this city. 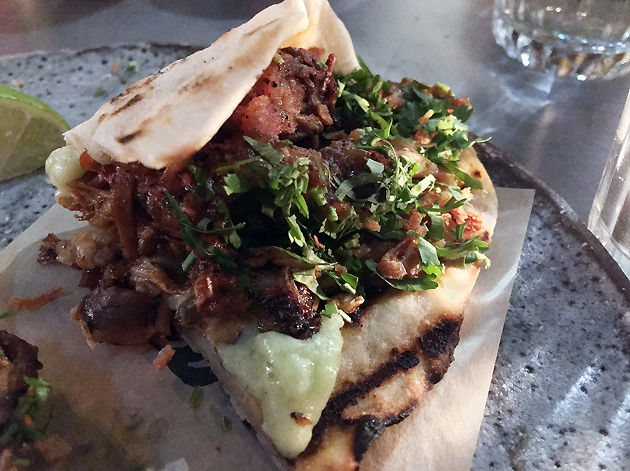 Tender, moist and earthily funky coils of lamb were lightly dabbed with blobs of milky cheese and stuffed into crisp yet yielding sheaves of flat bread. Crunchy crackling covered a moist and fatty hunk of pork belly. The pork was a little characterless and overly dependent on the fat for flavour, but it was still enjoyable overall – especially when taken with the sharp veg garnish and sprightly sauce. Nutty yet crisp and light totopos were far better than any other attempt at tortilla chips that I’ve had in London. And that was before you factor in the creamy, elastically gooey cheese laced with a fruity and umami tomato sauce. A decadent treat. 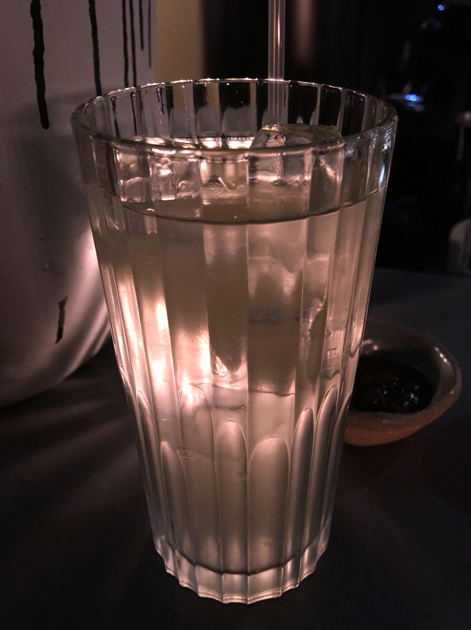 Grapefruit and agave agua fresca was a meek affair. The grapefruit was matched in its tameness by the watered-down aloe vera-ish taste of the agave. As delicious as my first meal at Breddos Soho was, any sane person would not have gone back. Luckily for you, my thoroughness trumps my sanity. 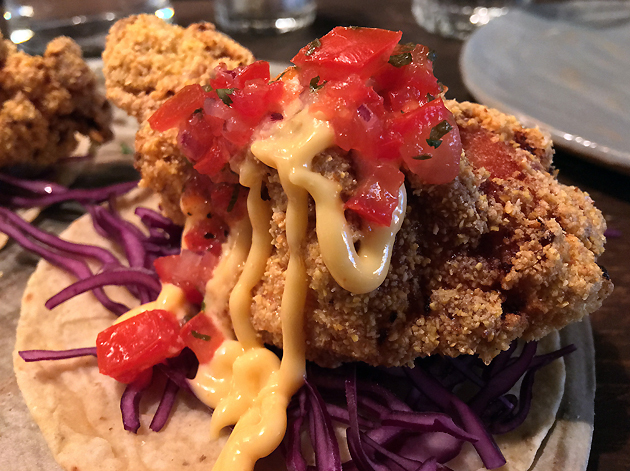 Although the fried chicken tacos weren’t as sumptuous as the version I tried at Breddos’ original Clerkenwell restaurant, mainly due to differences in the batter, it was still a wonder to behold. 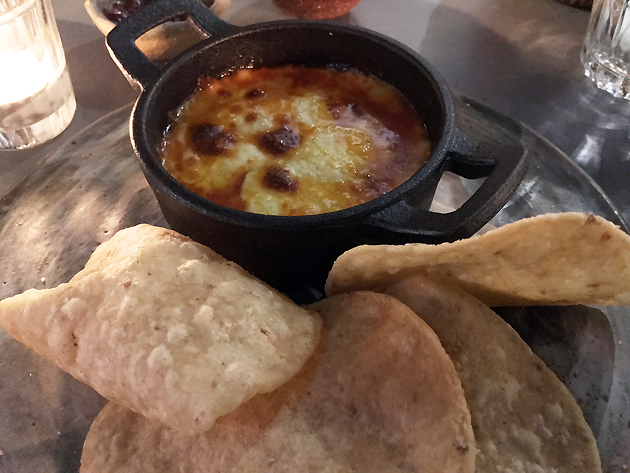 The thin yet fine-grained batter dotted with crisp bubbles had a nutty sweetness that meshed almost seamlessly with the tortillas. Although the latter could’ve been fluffier, the sprightly umami of the tomato sauce papered over these cracks. The pitch-perfect totopos made a welcome repeat appearance, this time topped with fluffy crab head meat which not only had a citrusy heat, but an unctuously meaty undertone courtesy of bovine bone marrow. A quivering egg yolk added an extra level of richness. Almost every other nacho dish in town is pig swill compared to this beauty. 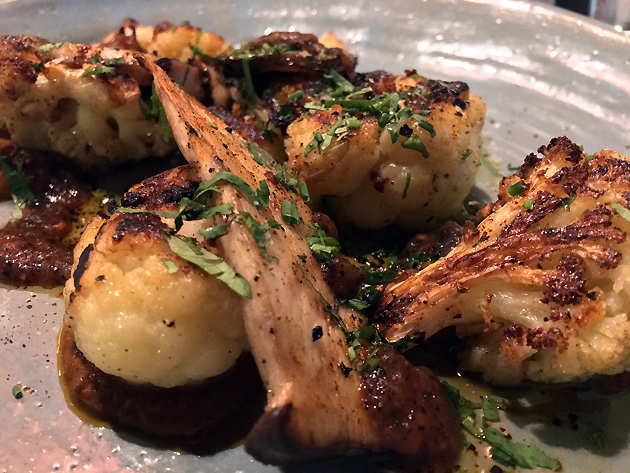 Cauliflower with oyster mushroom sounds like a sop for vegetarians, but it’s a dish that’s well worth having whether you’re a meat-dodger or not. Taut and slippery mushrooms contrasted neatly in texture next to the gently tenderised cauliflower. Both were similar flavour-wise in their butteriness which was enhanced further by the subtly moreish and salty sauce. 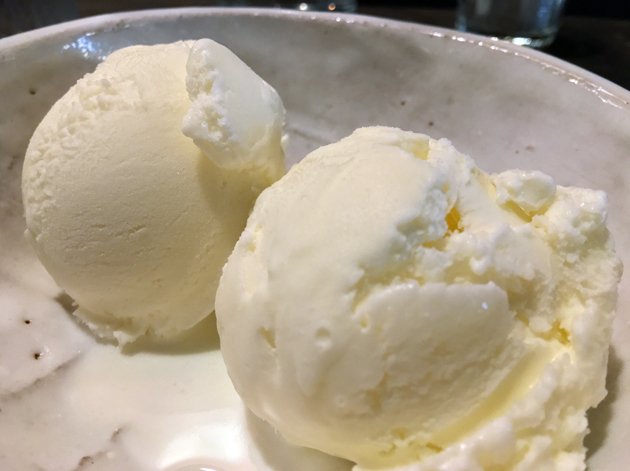 Fior de latte ice cream was a bit too crunchy with its ice crystals all too evident. It did have an underlying supple creaminess though, so this dessert wasn’t a complete loss. 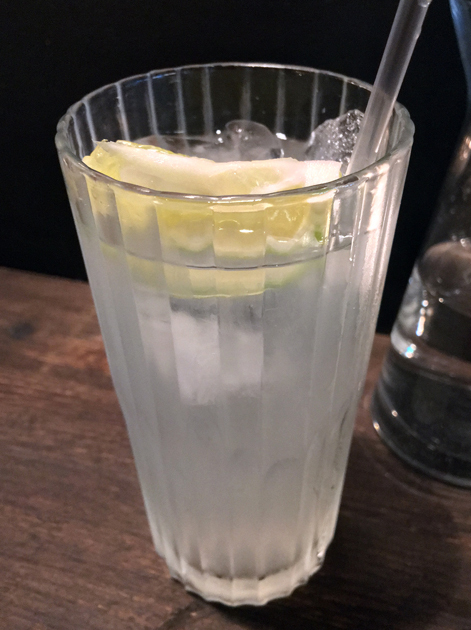 Much like the grapefruit and agave agua fresca, Breddos’ lime soda was refreshing despite tasting rather meek. Sadly, this isn’t really the place for you if you’re a teetotaller and want a quality non-boozy drink. It could be worse though. A lot worse. 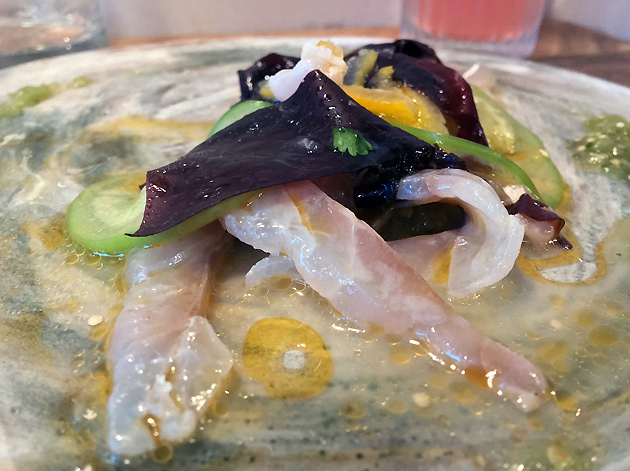 Breddos’ sea bream ceviche used firm, gently chewy strips of fish to great effect. As well as being texturally pleasing, the bream had a nutty start and a tart edge which meant it wasn’t entirely dependent on its gently spicy dressing for taste. The latter proved to be surprisingly complimentary to the taut and slippery seaweed, with everything coming together beautifully. Diver scallops were less successful. While rather thin and seemingly unmuscular, they managed to be reasonably meaty. However, their nondescript taste meant they leant heavily on the tingly spice of the dressing for flavour. This review’s procrastination was brought to you, in part, by Your Name. The thick, charred half-kilo knuckle of octopus tentacles was an impressive sight to behold. The punchy umami sauce, somewhat reminiscent of soy, was better soaked up by the supple and surprisingly absorbent spring onions rather than the firm and springy tentacles. 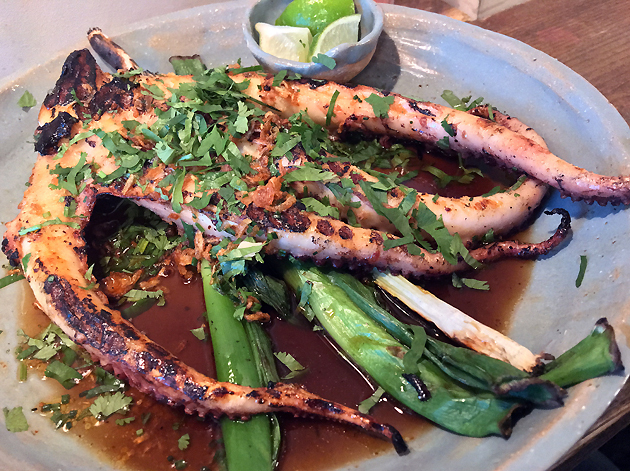 While not quite as good as the octopus at the newly revived Santo Remedio, it’s a worthy runner-up and a silent rebuke to the capital’s many other, far more substandard octopus dishes. 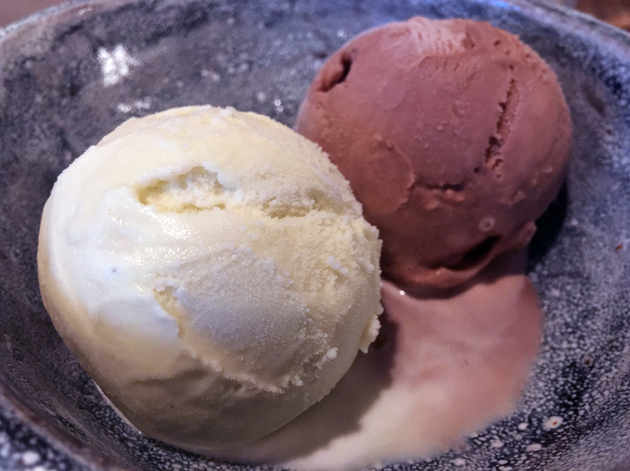 Breddos’ attempts at ice cream were far smoother this time around. 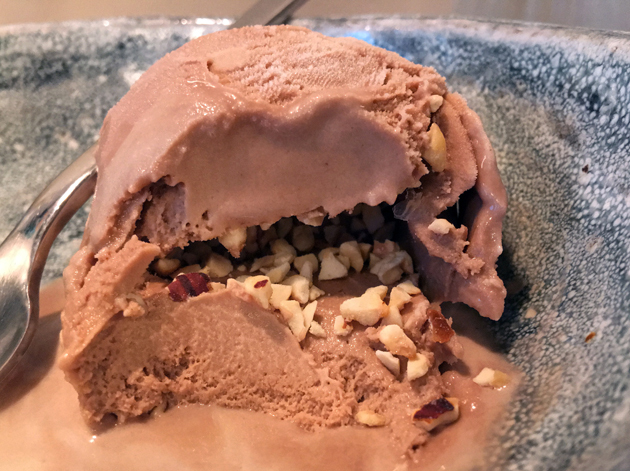 Although the coconut effort tasted of little, the hazelnut flavour had a reasonable level of nuttiness pepped up further by extant pieces of crunchy hazelnut. Although the prawns weren’t firm enough with a texture verging on mushiness, the head gunk had the evocative salty tang of the sea. 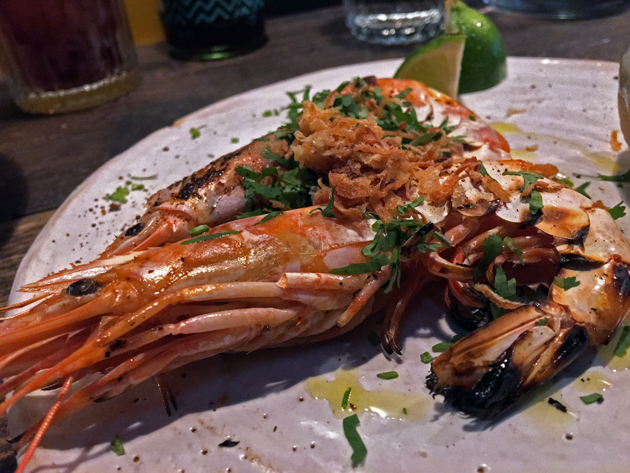 When combined with the pleasingly musky and zingy rub, which also leant the prawns a charred smoky smell, it largely made up for the prawns’ textural deficiencies. 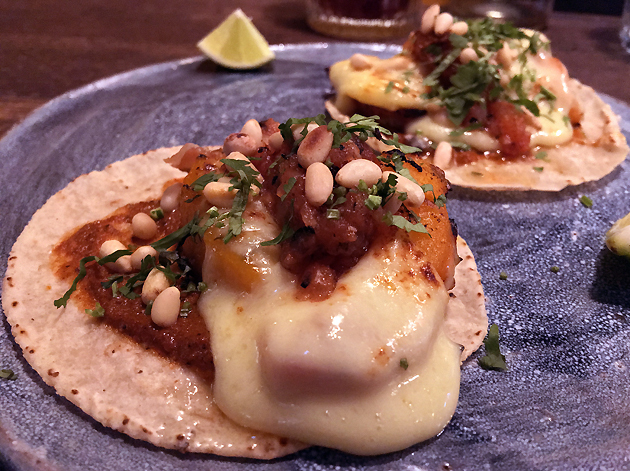 Breddo’s vegetarian taco option saw top-quality tortillas filled with Bermondsey frier, a gooey and salty cheese that proved to be the closest analogue yet to Oaxacan queso that I’ve had on this side of the Atlantic. Spot-on sweet potato and pine nuts rounded out an adeptly constructed and highly satisfying pair of tacos. Half a ‘roast’ duck seemed to have been flash-fried in an apparent homage to crispy takeaway duck. This is a rather odd choice given the generally inedible nature of that takeaway abomination. Although the skin was crispy, it was also a bit too greasy. The meat underneath was a rather characterless affair, with the exception of the fatty breast section. 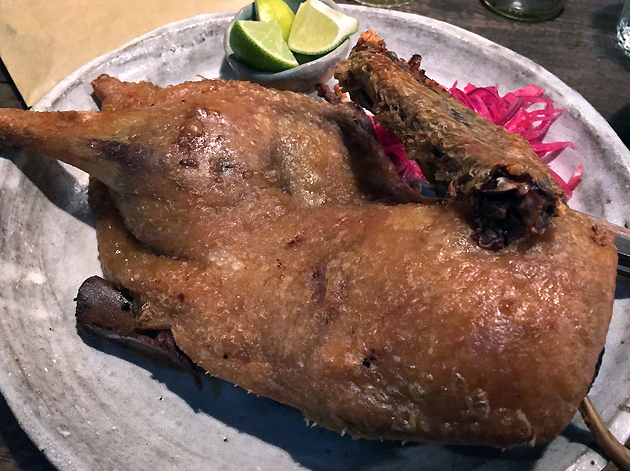 Only the quality tortillas, the thick, sweet and slightly tart plum mole and the musky hot sauce prevented the duck from becoming a chore to eat. 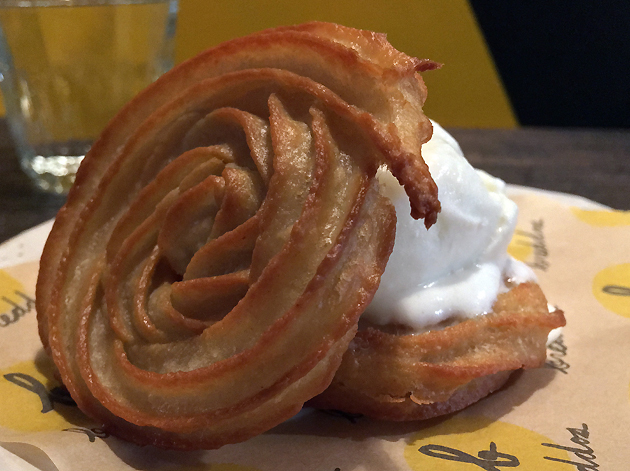 The churros ice cream sandwich used fried doughnut swirls as the ‘bread’ – lightly crisp on the outside, fluffy soft on the inside. It had a hard time containing the slippery ball of smooth coconut ice cream, but it was worth the mess though. The refreshing taste of coconut, much bolder compared to Breddos’ previous attempt, is just as worthy a companion for churros as the more usual chocolate and caramel dipping sauces. If this review was based purely on the quality of Breddos’ food alone, then it would be a near constant stream of praise from beginning to end. Despite some noticeable wobbles and missteps, such as the duck and scallops, the cooking at Breddos’ Soho displays much of the same verve and vigour found at the Clerkenwell restaurant and in its original street food incarnation. It’s not quite as stand-out brilliant as the Clerkenwell restaurant, not just due to slips in technique but also due to what seems to be a deliberate policy of playing it safe. 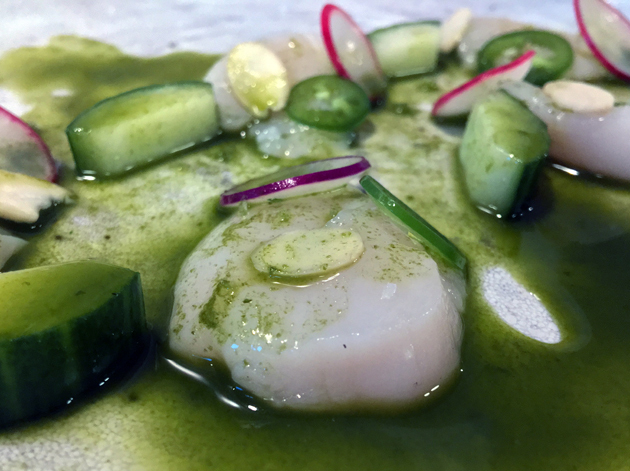 Some of the more ambitious ingredients, rubs and moles from the Clerkenwell restaurant – such as sea urchin and al pastor-style meat – are noticeably absent here. All this brings us back full circle to the service. Breddos Clerkenwell was also prone to slips in service during my visits there, but on a less teeth-grindingly patience-sapping scale and with more sincere-seeming apologies to boot. Their front of house problems seem to have multiplied along with their ambitions – the seeming lack of oversight is concerning. 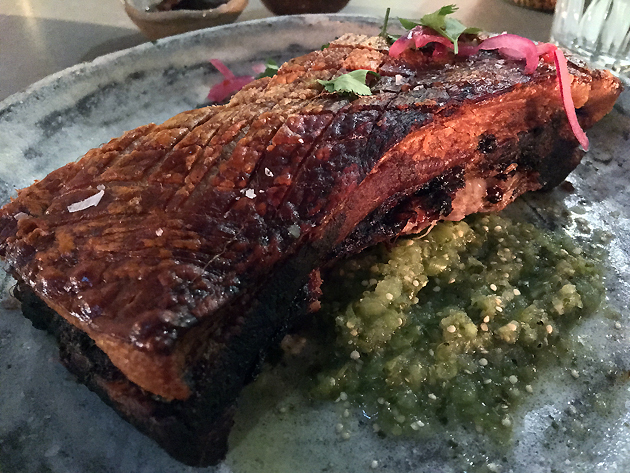 Even so, Breddos is still at the forefront of iconoclastic yet still inventively delicious Mexican-style cooking in London. 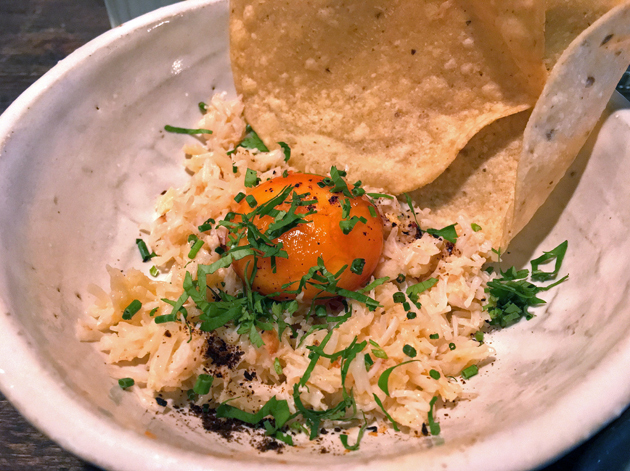 You should absolutely eat at Breddos Soho – just be sure to keep an eye on the staff. Opening Hours: Monday-Saturday noon-23.00. Sunday noon-20.00. Reservations? Only taken for the basement dining room. Tags: apple, bone marrow, breddo's tacos, cauliflower, ceviche, cheese, churros, crab, duck, fried chicken, hazelnut, ice cream, london, mushrooms, octopus, pork belly, prawns, restaurant, review, salad, scallops, sea bream, shawarma, taco, tortilla. Bookmark the permalink.